As was for last years, this winter2009/spring2010 season, AMVI wil carry out a campaign for training purpose. 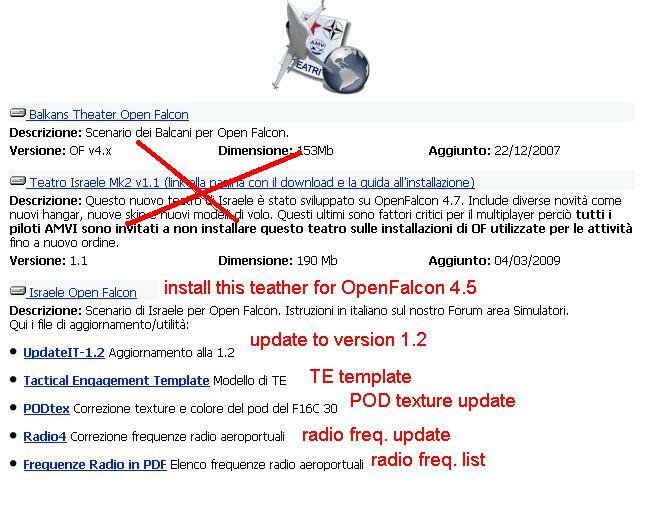 This will be based on Openfalcon 4.5 and Israel Teather of Operation. Our pilots will be requested to perform A-A and A-G missions with the task of improve their skills in standards and advanced procedures, use of NATO standard brevities, work under directives of human ATC and Awacs and will be called to Close Air Support missions under protection of A-A packages against RED opponents. As usual, we'll be glad to have some pilots from foreign groups flying on our Blue packages or as REd opponents, depending to the tasks prepared by our Mission Planners. We remarks that the first goal of this campaign is training, collaboration and have fun; it will not be Us against Rest of the World! Of course, when you'll be tasked to fly as RED opponents, we expext for your best skills and we'll do our best to give you high nightmares......but always in the spirit of what previous above stated. following this link : http://www.amvi.it/i...idx=download_f4 you'll be directed to our download page. At this point of the page, you'll find the theater and other updates . F4Awacs is allowed, depending to how many people is available on your side; when fly as Blue, ATC and Awacs will be usually carried out by AMVI crew. We'll try to employ foreign groups once in a month, so it will not be too expensive to find out from two to four pilots to participate. Date of beginning will be probably third week of november, but we'll keep in touch with you for updates. Thanks a lot for your interest.